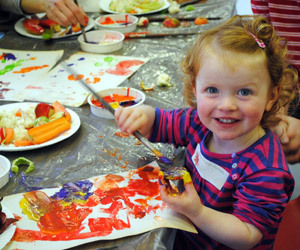 Messy church is what is known as a fresh expression of church, meaning that it does not follow traditional forms of worship. It is important in our mission to our community. The reason we regard mission as important is explained on the introduction to this section of our website. For some of our work we join with other churches in Formby through Churches Together or on a one-to-one basis. Our work with the church in Rwanda creates mission opportunities at home. St Luke’s and Holy Trinity Formby have worked together to pioneer a new form of church which is known as Messy Church Formby. It is primarily aimed at families with primary school children, but it aims to be inclusive and welcoming of all ages. A typical Messy Church includes around an hour of engaging in various craft activities on a set theme, a service of celebration and worship in the presence of Jesus, and then a time to sit and eat together and enjoy each other’s company with food and a simple meal. We meet at Ravenmeols Community Centre one month and then repeat the programme at Redgate Primary School the following month. In May 2012 we will be celebrating our Second birthday. We try and meet at a time that suits families with children and have found the 4-6pm slot on a Sunday afternoon very successful. Why not come along and join us and experience the Fun, Food and Fellowship that Messy Church has to offer! For more details please visit the Messy Church Formby website.